Starfleet Research and Duetto today announced a joint webinar that explores how top-performing hotels and resorts are maximizing their revenue results using next-generation technology. The research and insights are based on the experiences of hundreds of hotels that are achieving success. The webinar, entitled “How to Evaluate and Select the Right Hotel Revenue Technology,” will take place on Wednesday, June 13, 2018, at 12:00 PM to 1:00 PM EST. Click here to learn more and to register. Not only can next-generation technology provide an accurate window into future hotel demand; it can also automate pricing decisions to maximize room occupancy and overall revenue performance. For hoteliers, the investment in upgrading their revenue management capabilities generally pays off in spades — with a 10 percent or higher increase in RevPAR for some types of hotels, according to the latest research (click here to access). Of course, not all hotel revenue initiatives are the same. Different strategies, technologies and resources lead to dramatically different financial results. 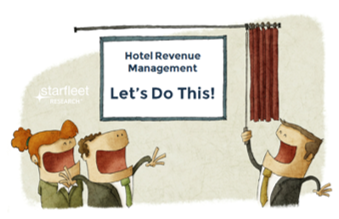 How can hoteliers maximize the value of their investment in revenue strategy? What are the biggest pitfalls with revenue strategy — and how can they be avoided? What are the must-have technology capabilities and data sources? What organizational resources, business processes and performance metrics should be used to maximize success? How can hoteliers drive continuous performance improvement? Jeff Zabin, Research Director at Starfleet Research, an expert on benchmarking best practices in hospitality technology, and the lead author of The 2018 Smart Decision Guide to Hospitality Revenue Management, will address these and many other key questions in the live webinar. Joining Jeff will be Eric Stoessel, Vice President of Marketing at Duetto, who will share his perspective on the benefits of next-generation technology for maximizing hotel profitability. He will also share how success can be measured and provide a few examples of revenue management in action.